Treat or treat! How about both? This year, you'll have to work for your (kids') Halloween candy. Click on each candy below to discover our Trick FOR Treat workouts and see exactly what it takes to burn off those sweet, delicious calories. 'Kick' Halloween candy calories to the curb with this football-inspired workout with fitness instructor Melissa Koester. You'll work on your cardio endurance, burning fat and perfecting your agility with tons of foot work. The goal is get through four sets of two exercises, doing five rounds of those exercises in each set. You don't need any equipment – just some space and a water bottle. Time to get that heart rate up. Let's go! Have a Butterfinger? Burn it off with our Sweat Like a Mother HIIT Workout! One of the biggest fitness trends today is the HIIT workout (High Intensity Interval Training). This workout structure is designed with specific exercises and timing to push your heart rate to the max. When you do this, you'll be burning calories way after the last drop of sweat hits the floor. Fitness instructor Ashley Winebrenner shows you how to use bodyweight moves to burn up a sweat. You'll work your hardest for 45 seconds, then rest for 15. As you get closer to the end, you'll work for 30 seconds and rest for 30. Quality over quantity, right?! Let Ashley get you warmed up and go for it! 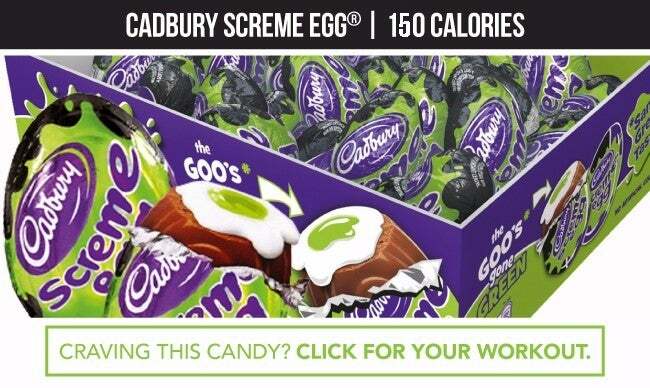 These Cadbury Screme Eggs are one of the most caloric of all our Halloween finds at 150 calories, 21 grams of sugar and 3.5 grams of saturated fatper serving, which is why it gets our most intense workout, the Ladder 10 Cardio Workout. If you can count to 10, you'll have no trouble with this workout. You don't even need equipment! Join fitness instructor Treenah Kight, as she leads you through 10 exercises, doing each one for 60 seconds. Once you get through all 10, you'll go back to the beginning and complete nine, then back to the beginning to complete eight, and so forth until all you have is one exercise. This is a big endurance workout, so get ready to grind! You'll be sweating your way through it for an hour. Let's go! Mike and Ikes are the best if you like chewy, fruit-flavored candies. 140 calories for 23 pieces isn't too shabby for this Halloween fave. But if you want to work off those fruity little gems, you'll need to try our This Body Rocks workout. Join fitness instructor, Holly Beck for an intense total body workout that will build muscle and burn fat. We are hitting every muscle in this fun circuit. Make sure to challenge yourself to get the full benefit of this workout. All you need is a light and heavy set of dumbbells to ROCK this workout! Are you ready? We love a Reese Cup as much as the next person and are willing to eat all 105 calories of the snack size version. Halloween season, lends itself to cooler temps and the urge to be outside before it gets super cold. That's why our Sweatfest Cardio Stair Workout is the perfect workout to balance out your Reese Cup binge. You can take your workout outside or use the staircase in your home for a refreshing and revitalizing sweat sesh! Not only are you training your cardio endurance, but your strength and agility skills too. Real Mom Model Holly leads you through an easy-tofollow circuit that can burn between 12 and 20 calories a minute! Make sure you're planting your entire foot on each step as you go. You'll be driving hard on the way up, and recovering with a brisk walk on the way down. Do this circuit up to three times for a real fat burner. Ready, set, sweat! 20-minutes of tabata is all you need to burn off that delicious fun-size Snickers you just took from your kid's Halloween stash...and more! Tabata is a classic workout structure that makes you work hard for intervals of time with bits of rest in between. Fitness instructor Amanda Strong has a sequence that will have you sweating for 35 seconds and marching for active rest for 10 seconds. No equipment is required. Let Amanda lead you through the warm up and cool down in this fat-burning workout. Keep your water bottle within reach — you'll need it! Skittles are one of our least caloric Halloween candy finds at only 60 calories for a fun size bag. Blast those calories with our quick 7 1/2 Minute Fat Blaster! Fitness instructor Melissa Koester will lead you through 5 moves for 60 seconds each, with 30 seconds of rest in between each move. Your heart rate will skyrocket, and you'll practically be able to feel those fat cells burning off. If you're up to the challenge, perform this workout twice through for maximum calories burned. Mixing cardio and strength is a great way to balance out that large Sugar Daddy you just inhaled. Fitness instructor Amanda is going to take you through the entire sequence. You'll need a kettlebell, jump rope and pair of dumbbells. If you're at home and you can't jump rope in the living room, do your jumps anyway with an imaginary rope. Chocolate, caramel and cookie-crunch? Yes, please! Eating a snack size Twix for 80 calories is no problem for this intense Bodyweight Workout. This workout has some of the best, most effective exercises are the ones that only require your own body. Think you can’t get a good enough workout without using weights or machines? Let fitness instructor Jean Sherfick take you through a complete bodyweight workout and see just how well they work! Who doesn't love Whoppers? These delicious bite-size malted milk balls are definitely worth the 100 calories per serving. Our 30/20/10 Legs & Booty Workout will blast every bit of those 100 calories and more. Bootcamp instructor Tina Russell counts you through three rounds: 30 reps of each exercise followed by round two of 20 reps and round three of 10 reps. Between each set, you'll perform high knees (30, 20, then 10). This workout will activate the glutes, abductors, obliques, quads and hamstrings. Give them a good stretch before and after.